"The World of "Mountain" Riviera . . . The Fast Buck . . . The Angry Men . . . The Lonely Women !" 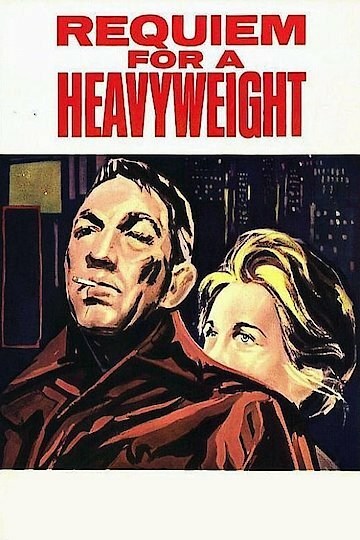 Requiem for a Heavyweight is a 1962 drama about an aging boxer. Anthony Quinn stars as Mountain Rivera. Rivera suffers a grueling loss in the ring to a young Cassius Clay (Muhammed Ali). His doctor warns Rivera that his fighting days are over. He is in danger of losing his eyesight if he continues fighting in the ring. Jackie Gleason plays Rivera’s manager Maish Rennick. Rennick is burdened by gambling debts. Mickey Rooney plays Rivera’s trainer and friend Army. Rivera is Rennick’s meal ticket, and he is not concerned about his failing health. Army is angered by Rennick’s willingness to exploit Rivera. Requiem for a Heavyweight is gritty and realistic. It shines a light on the seamy side of professional boxing and sports in general. Quinn, Gleason and Rooney are excellent in the movie. Requiem for a Heavyweight is currently available to watch and stream, buy on demand at Amazon, Vudu, Google Play, FandangoNow, iTunes, YouTube VOD online.